Female standouts Roxanne “The Happy Warrior” Modafferi and Aisling “Ais The Bash” Daly have verbally agreed to square off in a 125-pound bout at BlackEye Promotions 5, which is expected to take place on October 1st in Fletcher, North Carolina. Bout agreements have not yet been distributed. MMARising.com confirmed plans for the fight with multiple sources earlier today. Daly is coming off of arguably her biggest win to date, in a June upset of Jessica “Evil” Eye for the NAAFS 125-pound women’s title. 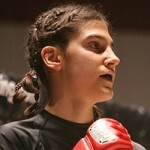 Modafferi has suffered a pair of razor-thin decision setbacks in bouts earlier this year. Modafferi (15-8-0) earned her biggest victory to date last May when she avenged a previous loss by edging out Tara LaRosa at the debut Moosin event. She would go on to challenge Sarah Kaufman for the Strikeforce Women’s Welterweight Championship two months later and fared well through nearly three full rounds before being knocked out by a powerbomb slam. She would not compete again until this February, when she came up just short in her debut at 125 pounds against Rosi “The Surgeon” Sexton, and is coming off of another close and competitive defeat to Hitomi “Girlfight Monster” Akano less than two weeks ago. Daly (11-2-0) opened her career with nine straight wins before suffering her first defeat in the opening round of last year’s Bellator 115-pound women’s tournament. Returning to 125 pounds, Daly made two appearances for Cage Warriors Fighting Championship, earning a decision win over Molly Helsel before being stopped in quick fashion by rising star Sheila “The German Tank” Gaff. Undeterred, Daly entered hostile territory to challenge Eye for the first NAAFS professional title in the 125-pound women’s division and survived a tough first round to submit Eye late in round two. With talk of a potential trilogy bout between Modafferi and LaRosa later this year, a victory over Daly would be Modafferi’s first step towards the tentative rubber match. However, it will be Daly who brings momentum into the October fight and a victory for the Irish standout would vault her back towards the top of the rankings. BlackEye Promotions 5 is targeted for October 1st at the Western North Carolina Agricultural Center in Fletcher, North Carolina. Article updated to reflect the change in event date from September 24th to October 1st. We will have a great card of female and male fights for Blackeye 5. We are excited to be featuring Roxanne v. Aisling this is a fight that WMMA fans will not want to miss.